On June 11, 2015, Bill Hurter passed away. Back in 2008, Bill hired me as the editorial assistant at Rangefinder magazine, a trade photography publication. I didn’t have any magazine publishing experience, but I really wanted to break into the industry. Bill taught me how to edit and work with writers. He taught me the photography basics and what made a good image or a great cover photo. We spent a lot of time talking about his cat, my cat, and the outdoor cat that hung outside of his office window. In 2013, I won a WPA Maggie award for best feature article for VegNews. I was the senior editor—a long way from being a newbie in the magazine world. When I accepted my award, I thanked Bill, who wasn’t there, but I wanted the industry to know that if he hadn’t taken a chance on me back in 2008, I wouldn’t be standing there with this award in my hand. 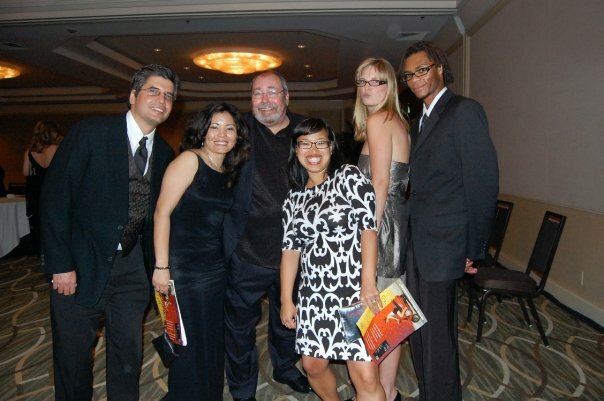 The Rangefinder editors and art department at the WPA Maggie Awards in 2009. We joked a lot. There was once a fierce mini-basketball tournament that I organized with the crew, with no joke, a little tiny basketball and this small hoop. I made it March Madness-style brackets and the competition was fierce. Bill was pitted against George, who jumped up and down and got in Bill’s face to distract him when it was Bill’s turn. If I remember correctly, Bill calmly shot his tiny basketball and beat George. He even took it in stride when I dressed like him on Halloween, down to his trademark LA Dodgers hat and jean shorts. The Rangefinder gang on Halloween 2008. Bill was a true friend. He saw potential in me and always encouraged me to believe in myself. In his memory, I’ll keep his spirit alive by believing in my work, and always remember to laugh at myself once in awhile. RIP Bill. We miss you. What a beautiful tribute to your mentor–Bill sounds like a great editor and a fun person. He will be missed by many. . . . Thank you so much. I wanted to recognize and honor his contributions to the world. Such a nice tribute to Bill. We did have fun! We did! We worked with a great group of people.